Provide structured support and extra practice with differentiated questions that focus on reasoning and problem-solving building the exam skills needed to succeed. All questions from the Student Books will be available with corresponding grades and answers via the website and our Dynamic Learning Teaching and Learning resources. Find out more about the 2015 GCSE Maths curriculum. On the 21st May Ofqual announced the actions of its research to evaluate the four major exam boards’ SAMs for the new GCSE specifications. To support you through these changes we have put together the below FAQ’s to answer some of the key questions and show how our resources can support you and your students thorough the new specifications. Enhance your lessons with a bank of ready-made resources, interactive tests and activities. Download our info graphic to see a full list of what’s included and how it can help you. Have you seen the new textbook guidance from the NCETM? Here you can view the guidance and examples of how are resources meet it. Below we will be adding free sample lessons from our OCR 11-16 GCSE digital Teaching and Learning Resource. These cover tricky topics that students struggled with in the 2017 June exam. Attend our new (OCR/ Edexcel) GCSE Maths specification courses to explore the key areas of change and receive essential advice on how you can be more confident delivering the new content. 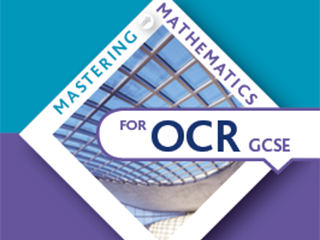 KS3 Mastering Mathematics and Mastering Mathematics for OCR GCSE focus on strands of learning within the new National Curriculum to improve progression throughout Secondary Mathematics. Take a look at the below 11-16 Progression Pathway chart that shows how the Mastering Mathematics strands are mapped to the new curriculum for KS3 and GCSE. You can also download a fully editable and easy to read Scheme of Work version. Take a look at our guide to Mastering Mathematics for OCR GCSE to see how our print and digital resources support the new specifications. Build your students' knowledge and understanding so that they can confidently reason, interpret, communicate mathematically and apply their mathematical skills. About KS3 Mastering Mathematics and how the series can help your students move from KS3 to KS4.